This past Memorial Day weekend I had nothing to do, no plans, didn’t have my kids. I decided to take an impromptu trip out West and do some riding and camping. I’m not one to do things spur of the moment but something gripped me and told me it was right. 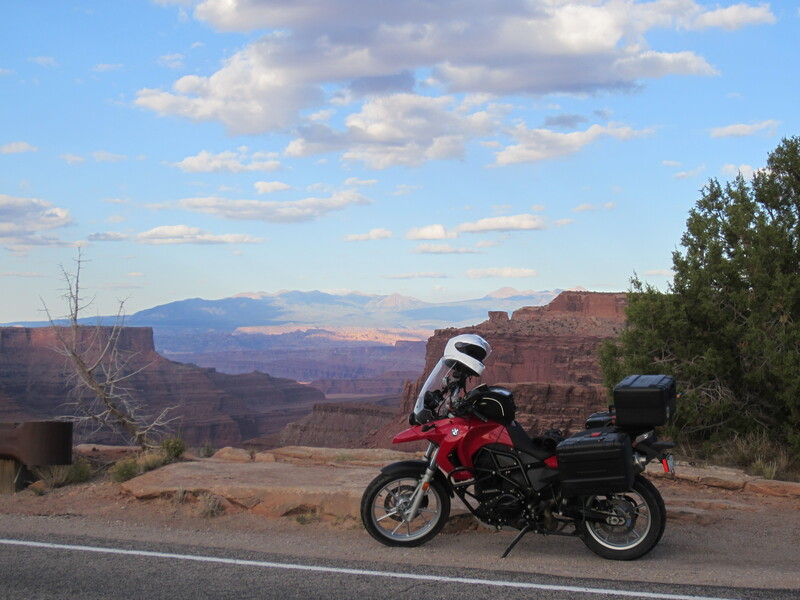 So I told my co-workers I was taking Friday off, hopped online, booked a cheap flight to Denver ($300 roundtrip on Southwest), found a motorcycle rental place and reserved the cheapest bike they had (BMW F650GS at $135 a day) and decided to do something I’ve never done before. Just take off. I’m so freaking glad I did it. Colorado and Utah are stunningly gorgeous. 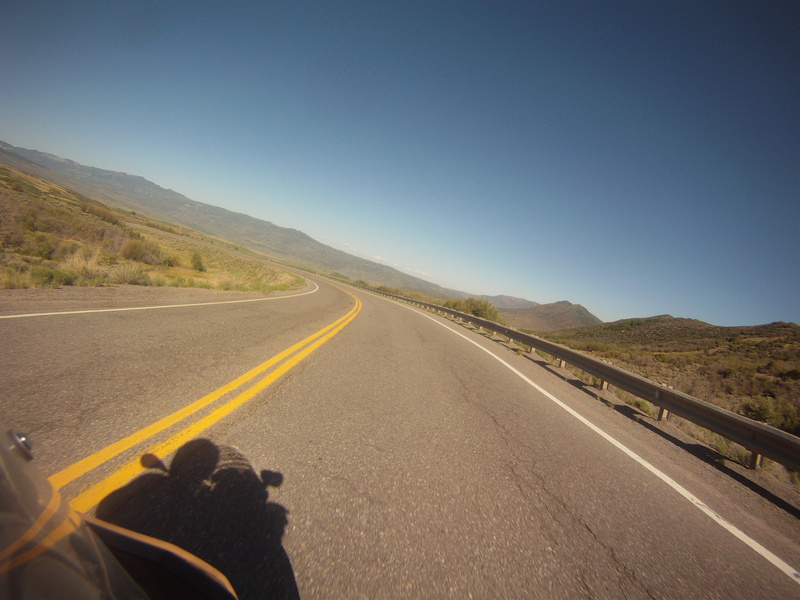 There is no such thing as a bad motorcycle road out there. The people are just fantastic. Even though it was just four days, it was the experience of a lifetime. I love being on a motorcycle. Work. My plan was to get the bike early in the AM and get started early-early Friday morning, but I had a client crisis blow up and had to work for a good chunk of the morning from my hotel room at the Denver Airport. I didn’t get on the bike until later than I wanted. I got a speeding ticket. There was exactly one rural stretch of Route 50 where the speed limit dropped to 55. The rest of it is 65. Guess where there were about 5 cops all up and down the road? What really galls me – I was doing 70 in a 55. Anywhere else on the planet, the cop wouldn’t look up from his donuts. Not this two-bit backwater deputy sheriff, no sireee. So there was a tax of $169.50 on my trip. Officer Turner of the Montrose County Sheriff’s Department: you should be ashamed of yourself for your part in this fraud perpetrated against unsuspecting Colorado tourists. Windstorms cut my day short on Saturday. My plan was to make it to Moab by Saturday but the wind as I got closer to Grand Junction was ridiculous. When I stopped for gas someone told me that this was due to a big windstorm and there would be 75-90 mph gusts. I decided against traveling any further that day, as I was having a hard enough time keeping my light 650 upright on certain stretches of open highway. I checked into a hotel and chillaxed. Shortly after this picture was taken (on top of Pike’s Peak), I fell flat on my face because of disorientation from the change in altitude. Pike’s Peak. 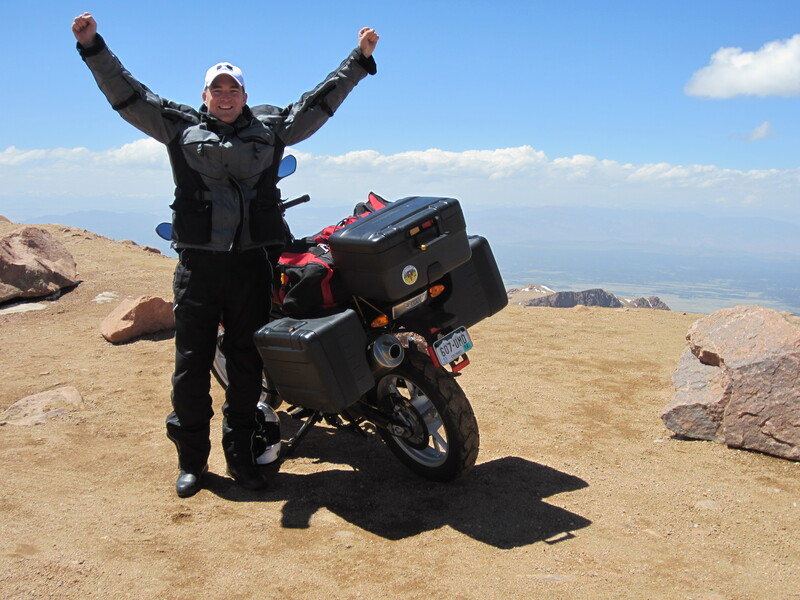 Climbing Pike’s Peak on the 650 was a major accomplishment. At the top I met a fellow inmate from the Advrider forum who chatted me up for a bit and gave me some great tips for future trips. Arches National Park. Every American should see this in their lifetime. Jaw dropping. Moab, Utah. Sedona, but on a much grander scale. I told my daughter (who loves Sedona) to imagine Sedona, but 100 times larger. Reddit. I met up with a friend from the Reddit motorcycle forum in Grand Junction. He spent an hour with me giving me lots of helpful tips. The cameraderie of motorcyclists is pervasive! 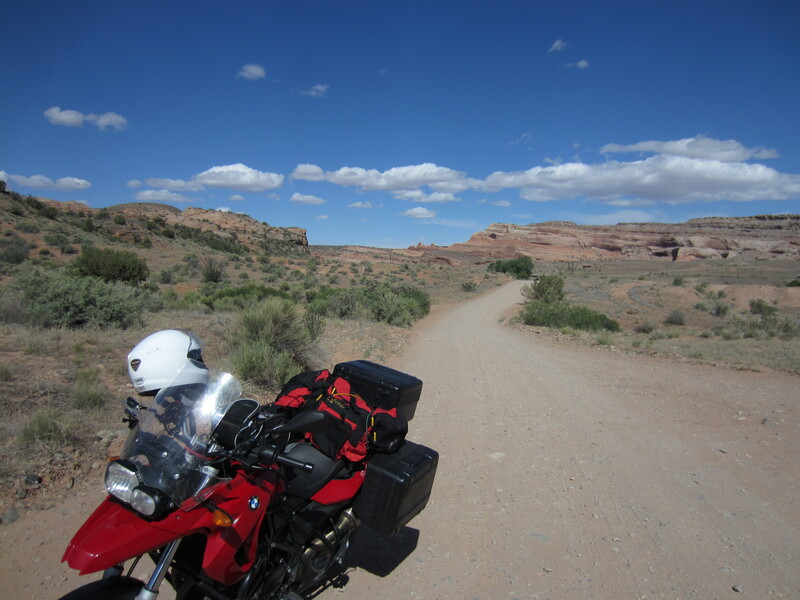 Roads like this look inviting, especially on a GS, but it takes a very different skill set to navigate them. Offroading is way harder than it looks. Sand is evil. Acclimatize. Don’t go from sea level to 14,000 feet in the span of 24 hours. I was really struggling at the top of Pike’s Peak. The Lost Cajun. What a great little restaurant in Frisco, CO. Only 5 minutes off interstate 70. By all means, stop there and enjoy the company of the owner, Raymond Griffin. The food is wonderful but Raymond’s life wisdom and company was worth the trip all by itself. I’ll be doing more impromtu ( and promptu ) trips like this. I’m already scheming about when I can do something like this in Ireland. Stay tuned. 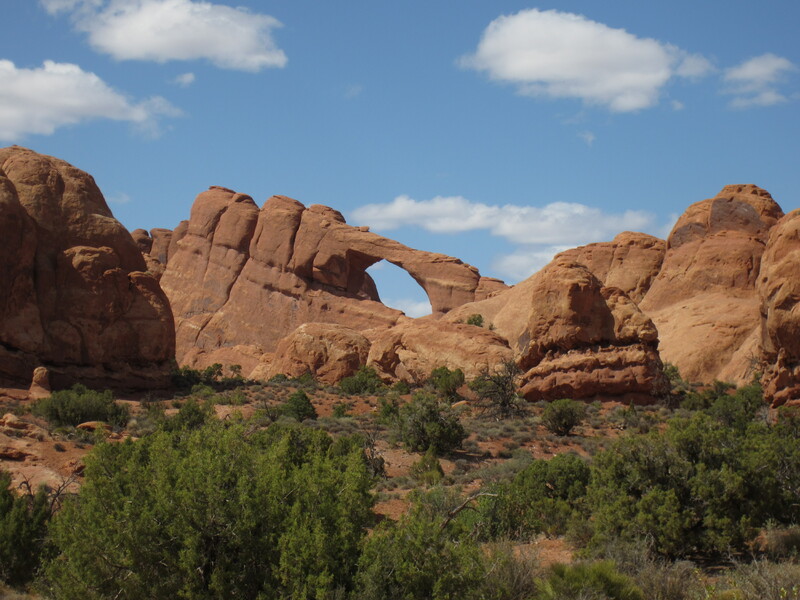 Arches National Park is a must-see. I’ll post more pictures and video in the coming days. I lived in Colorado for 7 years and started riding there as well. The place is straight up radical. More impressive is your resolve to get up and seize the day. When we live life we never loose. Thanks for the reminder!